I never could have imagined what a simple package of wedding invitation envelopes could teach me about my relationship with Jesus. It started innocently enough. While I was visiting family in Minnesota with my fiancé, I started looking online for envelopes that would hold our wedding invitations. I quickly zeroed in on some beautiful, matte-gray envelopes that could ship to us in a few days. I mentally crossed “buy wedding invitation envelopes” off my to-do list, only to realize a couple weeks later that I’d never actually ordered them. And by then, I was back home in Canada and the cost of shipping had quadrupled. Frustrated that I had already wasted so much time, I grimaced and ordered the envelopes, only to realize that I was now subject to expensive international import fees. I suffered through multiple failed delivery attempts and miscommunications with the shipping company until I finally arranged for my envelopes be delivered to a nearby pick-up location so I could grab them after work. At this point, even the thought of the envelopes made me grind my teeth in exasperation. I felt cheated out of my hard-earned dollars and stressed that they were taking so long to arrive. I ranted to my fiancé daily about how terrible the shipping company’s service was, and I was even getting distracted during my prayer time, seething about the envelopes. And so, ready to put it all behind me, I went to get the envelopes at the pick-up location, only to find the building closed. I tried again the next day: CLOSED. I had arrived on time, and their business hours were posted in the window, but inexplicably, the door was locked and the lights were off. Furious, I called my fiance, who found out that an unexpected building problem had forced the place to close for two days. I could not believe that a shipping company would drop off a package at a “convenient” location where they would hold my precious cargo hostage for days on end. By now, it had been more than three weeks of mounting daily frustration and stress about these envelopes. It was maddening, and boy, was I giving in to every temptation to fly off the handle! It felt justified. Their service was undeniably terrible, and the last thing I needed in the middle of all the logistics of wedding planning was to chase this expensive package all around town. So I took every opportunity to rant and rave to everyone around me about how crazy this situation was. So yes, I did lose my mind when the friendly young clerk behind the counter told us there was no package for me. Although the shipping company had notified me that the package had been “delivered” on Thursday, the pick-up location had in fact been closed, and so the clerk guessed that the delivery man must have taken the package back on his truck. I knew this was all true, and yet the rage inside me wouldn’t die down. What was happening? I’m a slow processor. It usually takes me a few hours of mulling over an idea get a good perspective on it. So that evening, during my prayer, I placed that question before Jesus again: Why was I so furious about the envelopes? What was God trying to show me through this maddening experience? In the quiet pondering and listening for God in my heart, I realized that my issue was what (or who) had control of my heart. In the midst of all the details of wedding planning, I gave in to the temptation to become a “bridezilla” when something didn’t work out the way I hoped. But this was the opposite of what God and I had already talked about: right from the start, I had promised to give my engagement to Jesus. I promised him that every detail, every moment, every plan would be abandoned to his Divine Providence, and that I would be docile to him, no matter what. In those early moments of frustration about the envelopes, I should have turned to my Savior with a smile. I should have laughed at the misguided thought that I am in control of my own life. I should have embraced my littleness and entrusted the whole box of envelopes right into his hands, like a child does to a loving father. By clinging to control over the envelopes, I allowed anger to burrow deeper and deeper into my heart until I couldn’t control it any longer. This was my chance to finally surrender. With total peace in my heart for the first time in weeks, I gave the envelopes to Jesus. The next day, I called the shipping company again. I explained the situation, and they assured me that the package had been dropped at a different location just down the street. All I had to do was collect it. So I did. Now, I have both the envelopes and a valuable lesson: wedding planning, just like everything else in life, is an opportunity to give the smallest details to Jesus — even the envelopes. 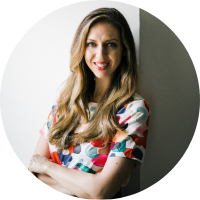 About the Author: Becca Arend is a twenty-something who loves Jesus. As a proud Minnesotan who recently moved to Halifax to be nearer to her fiancé Chris, she loves American things like Chick-Fil-A, spelling words without an extra u, and the Imperial System. During one of their many adventures, volunteering to rebuild historic cottages in the Grand Tetons, Nick asked the love of his life to accompany him on their greatest adventure yet: marriage and family. 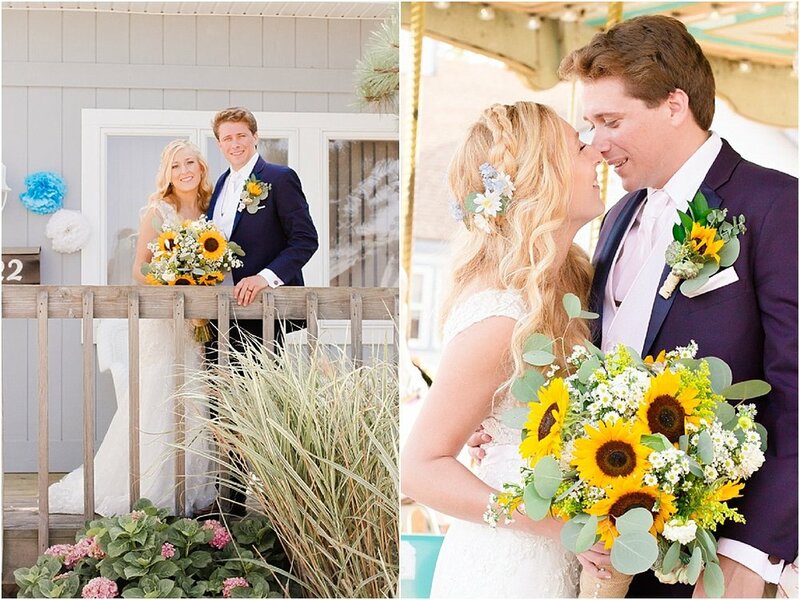 Their love story encompasses conversion, Padre Pio, the Jersey Shore, and beehives--all part of their extraordinary, summertime wedding bathed in sunflowers and God’s grace. And it all began in a college architecture class. 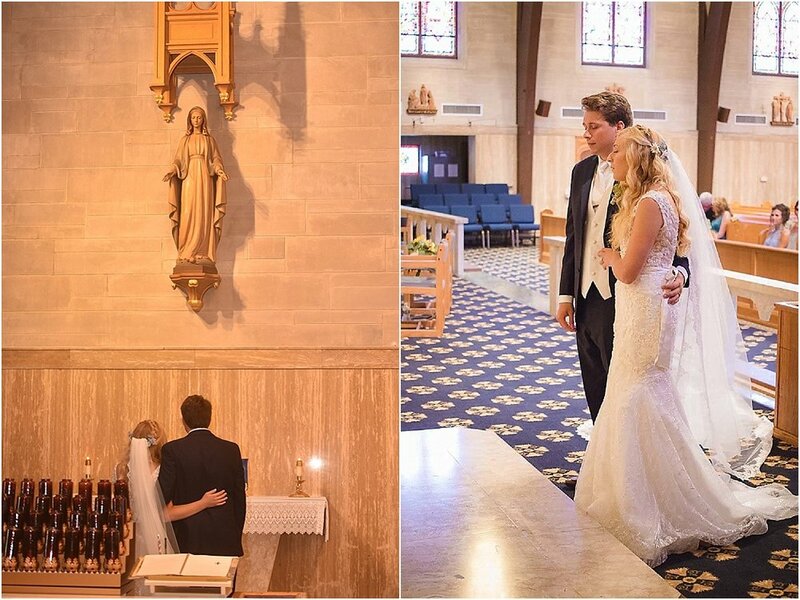 From the Bride: Our Catholic relationship was not a typical one. I am a cradle Catholic who started to grow deeper in my faith only after college. Nick's mother is Lutheran, and his dad is Catholic. He was raised primarily in his father’s faith, but he did not receive any of his sacraments beyond baptism before dating me. Nick and I met during our first year of college at the New Jersey Institute of Technology in 2010. He had transferred from Hartford, and I had just graduated from high school. Looking back, I almost attended a different college. God’s plan is perfect, though, and we both chose to attend NJIT in 2010. We were placed in the same studio room for our architecture class and quickly became good friends, especially since we were both commuters. Nick would wait for my dad to pick me up on his way home from work. He would even miss his train ride home to wait with me. We supported each other through late nights in studio, and he always kept me laughing. We became good friends but didn’t start dating until our fourth year of college because I had been in a previous relationship until then. Nick was quick to seize the opportunity. Three and a half years later in August 2017, Nick and I found ourselves in the Grand Tetons National Park. For the past three years, we had volunteered a week of our time annually with the National Park Service in the Grand Tetons to stabilize historic log cabins in the park. Nick proposed in the barn we were working on for the week in front of all the volunteers. It was like a dream. We decided to get married a year later on the anniversary of our engagement. As we prepped for the wedding, Nick went through RCIA with me as his sponsor. He would come to my bible study group, and our faith grew deeper. We attended holy hours together, and I knew I was growing in my faith along with him. We planned to get married at the church by his family’s shore house that we attended all the years we dated: St. Pio’s. After our engagement, my friend Gabriella found a St. Pio rosary and gave it to me. I prayed on it every week at adoration leading up to the wedding. I even wrapped it around the stem on my bouquet with a miraculous medal. Nick and I developed a strong devotion to Padre Pio. We prayed his novena and asked him to adopt us as his spiritual children and be the patron saint of our marriage. We also prayed St. Josemaria Escriva’s novena in the days leading up to the wedding, which we loved. Throughout it all, I petitioned God for Nick’s full and deep conversion to the Catholic Church. And although we both have more room to grow, I’m so proud of how far we have come, especially Nick. The night before the wedding we went to confession with the priest who would be celebrating our nuptial Mass. We wanted to receive the marital sacrament with pure hearts, and I’m so happy Nick and I made sure we did that. Before going to sleep we called each other and said the last day of the St. Josemaria novena. It was such a beautiful way to countdown to the wedding. 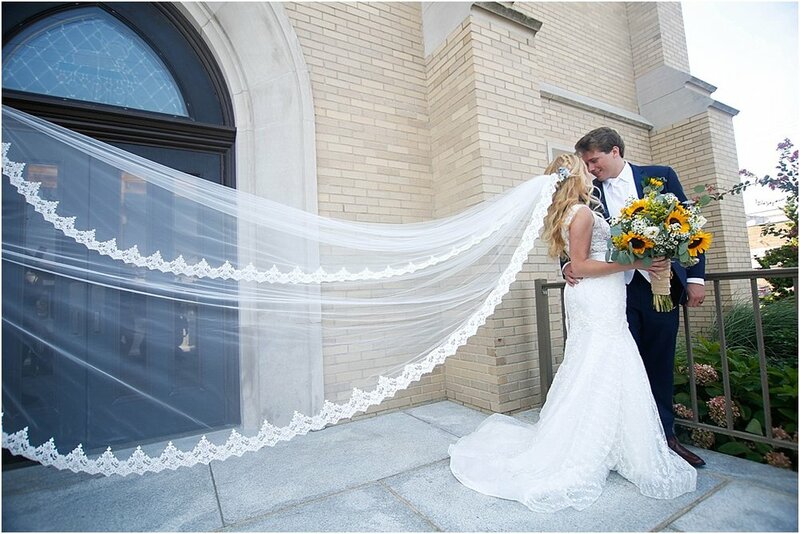 The weather on the big day was hot but not too humid, and I felt like God was smiling on us the whole time. My friend Gabriella said a quick prayer as we walked into the church, but I told her it had to be a quick one because I would be too emotional. I’m such a happy crier! 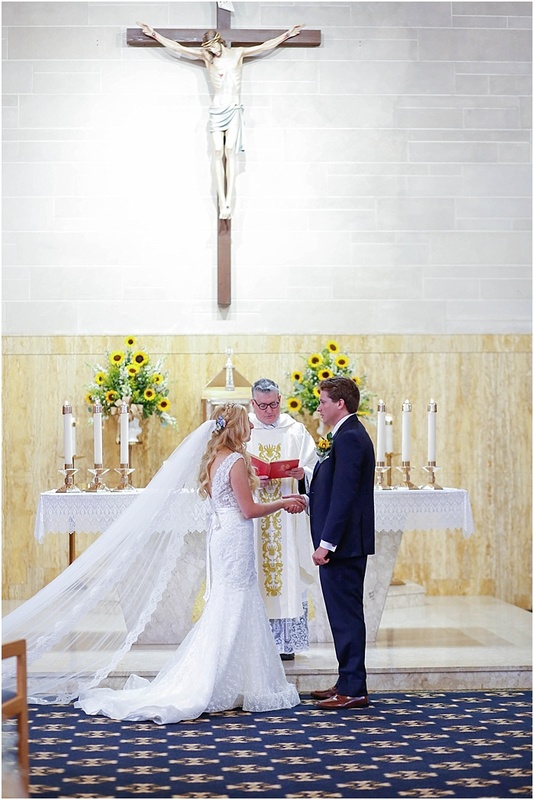 I kept asking God and Padre Pio to be with me because I was so nervous to walk down the aisle. When they opened the doors, I tripped a little on my dress. This helped me focus on not falling, but I also think it was God’s way of giving me something to think about instead of becoming a crying mess. When I looked up at the end of the aisle, Nick was crying hard. He was so happy, and I felt such peace knowing I was marrying him. As the ceremony went on, I strongly felt Padre Pio was with us as well as our guardian angels. Nick and I had picked all of the music and readings for the Mass, so it was very meaningful to both of us. When we presented flowers to the Blessed Mother, we prayed a couple of Hail Mary’s and then a prayer we had written together. It was such an intimate and special moment. With that in mind, we received the Body and Blood of Christ together for the first time as a married couple. All I could do was look at Nick and thank God for giving me the man of my dreams and allowing me to lead him closer to Christ. We had worked so hard on planning the wedding, but the work we put into our faith life was worth more than anything else that day. After the ceremony we left on a trolley to Smithville to party! The theme of the wedding was “adventure” because Nick and I always say that we are adventure buddies. And we handmade everything for the wedding. We are both architects, so we knew we could do it. Our invitations, made by hand, included a map of the Jersey Shore with all the significant places to the wedding and to us. Our favors were honey jars made from our own honey that we harvested the weekend before the wedding from our beehive. The table that displayed the honey also displayed birdhouses that Nick had made for me when we were dating. I wrote all the table assignments on panes of glass from old windows, and the tables were named after different national parks. 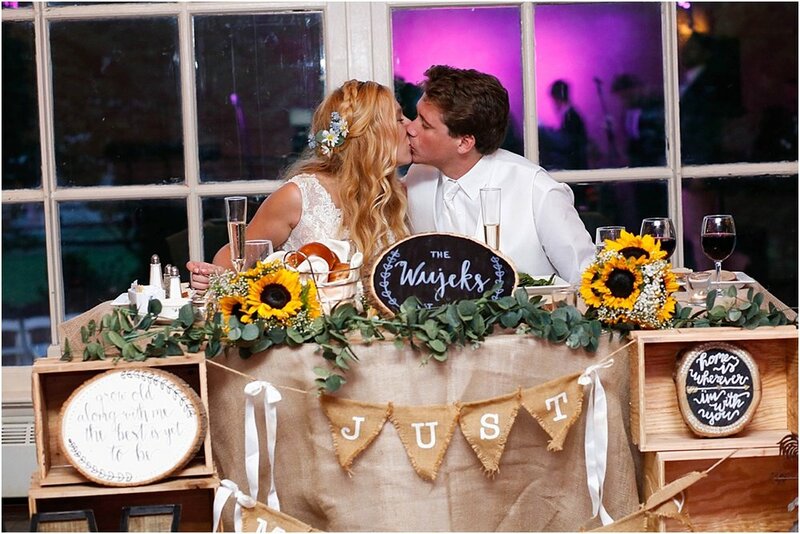 Nick and his dad built wooden crates for the centerpieces, and we filled them with flowers and fresh peaches. We told everyone to take home a peach with their honey. 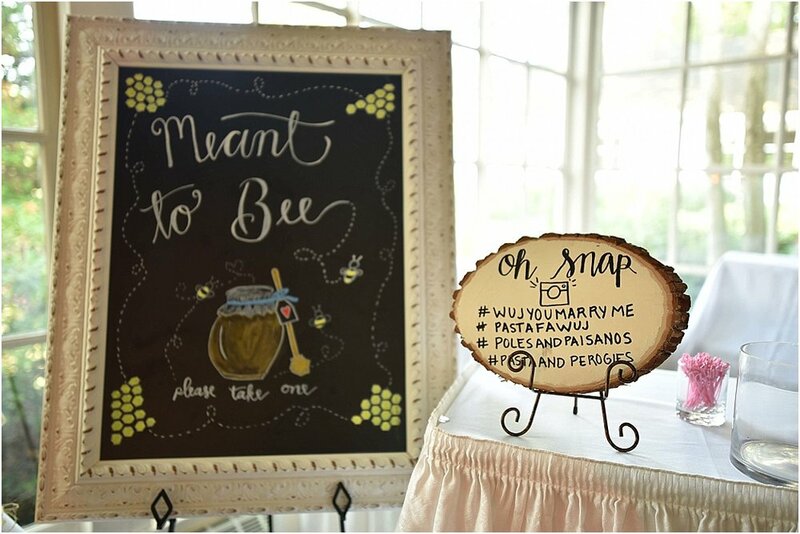 Our sweetheart table had handcrafted signs that I painted as well as more crates. Nick’s mom and I made a quilt together that had Disney’s Up house on it. That became our “guest quilt,” where everyone signed in on a balloon. 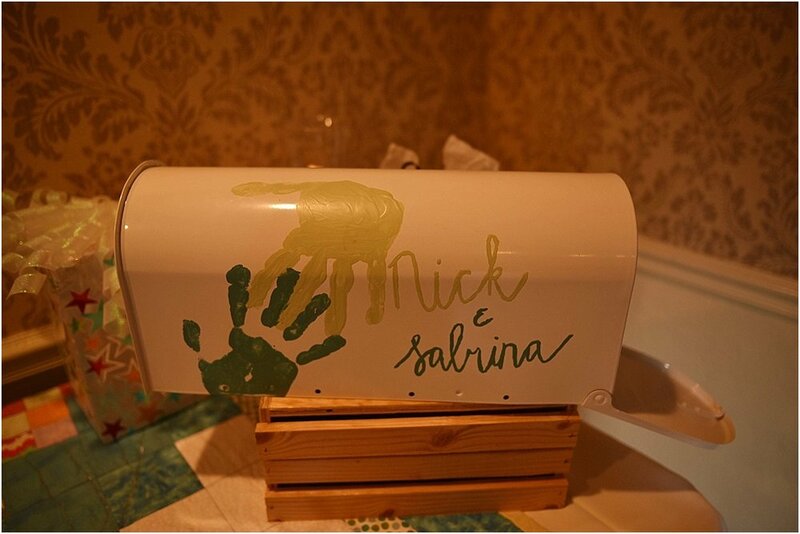 And finally, we painted a mailbox like the one from Up where guests placed their cards. 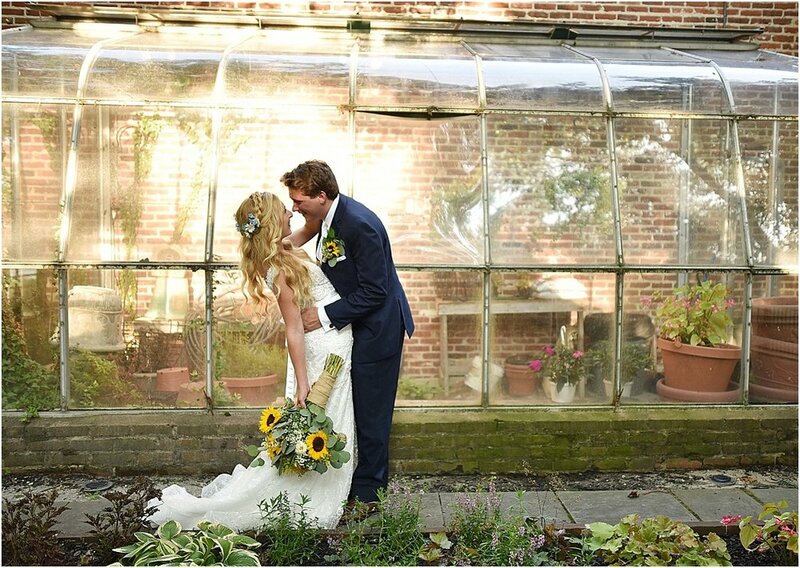 My favorite flowers are sunflowers and succulents, so there were plenty throughout the whole wedding. We took photos all over Smithville, a cute, historic town with many photo opportunities. And our wedding band kept everyone dancing all night. In short, our wedding day was amazing, and I thank God everyday for it. I couldn’t wait to live life with Nick and build on the foundation we built on Christ. For our honeymoon a month later, we travelled to Rome and Switzerland after my friend Gabriella’s wedding with her and her new husband. In Rome, we attended the Sposi Novelli blessing at the Pope’s general audience. Again, I was praying to Padre Pio that we would get to meet the Pope, but there were so many couples there that it seemed unlikely. They started gathering all of the couples, and we found ourselves in the wrong spot. It seemed like we wouldn’t get to meet him. I told Gabriella and our husbands that we should stand on a shorter rail that I spotted. I thought even if we wouldn’t meet him, we could at least get a better view. That short rail ended up being the gate to let all the couples into the main area for everyone to gather. So we were the first ones through! When we got our spot, I realized I had lost my Padre Pio rosary. Gabriella told me not to worry, that Padre Pio was with us anyway. But when we looked down, I saw the rosary had somehow landed in the spot we were going to stand in! When we met the Pope, we told him we were praying for him and that he needed to rebuild the church. Gabriella and I got pretty emotional about this, so he spent a long time with us saying that he would, and that we needed to keep praying too. It was one of the most special experiences of our lives to receive the Pope’s blessing. Nick and I have had the most incredible year, and it is all because of God and his perfect plan. Without a Christ-centered relationship, our entire wedding day and our marriage would've been completely different. It would never have been as fulfilling. You could feel our love for each other and for God that day. Everyone said that is what made the wedding so special.